Sterling Tree & Lawn has the necessary equipment to stabilize damaged or weak trees and prevent a disaster from happening on your property. Call today for an assessment. It is possible that because of the way a tree grows, it can no longer handle its own weight, creating a potential hazard during a normal winter storm. If a branch falls it could damage property, cause loss of life or cause a decline in the tree’s health. 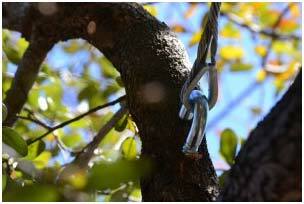 In order to secure these trees so that you can confidently enjoy them on the property, cable and bracing rods are used. 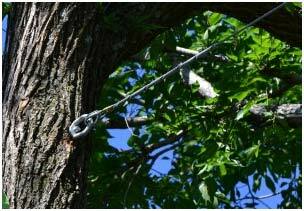 A Board Certified Master Arborist should be consulted to see whether your trees can be helped with cables and braces. 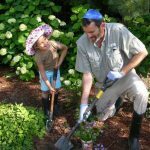 If they are placed properly in various locations, they can help relieve the stress the tree is under and provide support for weak branches. Cabling and bracing is often used for splitting branches and trunk. To help the situation, pruning is also done to reduce the weight of branches and a combination of these techniques often saves the tree.